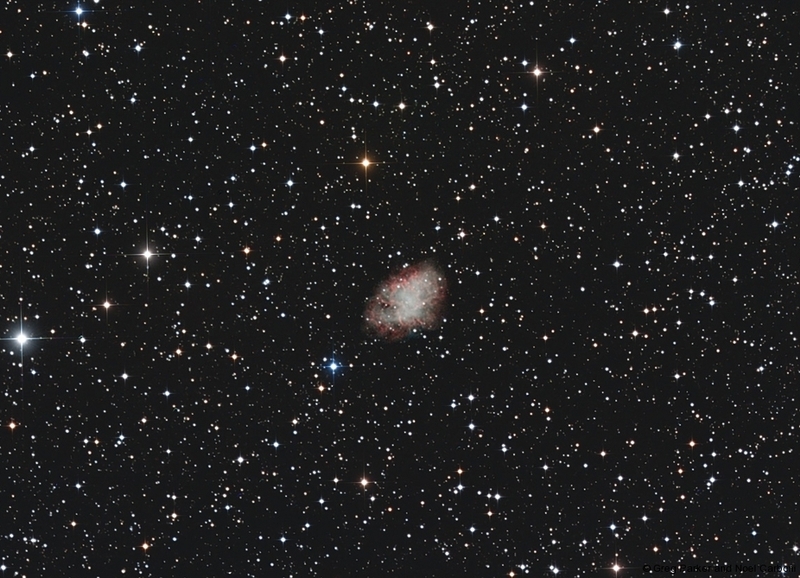 The imaging object for this month is one of the most famous supernova remnants, and the first entry in Messier’s catalogue – it is M1, the Crab nebula in the constellation Taurus. This tiny object, only measuring 6′ x 4′ (that is arcminutes note, 1/60th of a degree) is also labelled as NGC 1952 and lies around 6,500 light years away. Firstly, being so small, you really do need a longish focal length to do this object justice. My 400 – 500mm using either the Sky 90 or the Hyperstar III is simply too short. It has amazing colour and detail and would do well with narrowband imaging – the incredible Hubble image of this object is I believe one of the highest resolution images taken of any deep-sky object – and it shows! Although we cannot possibly compete with Hubble on this one, we can get as many narrowband subs as we can at high sampling (I would suggest you sample at around your local seeing limit). You can see from my image below that you can still get quite some impressive detail even with short focal length imagers, and you have the added bonus of seeing the Crab in context – a lonely object in a fairly barren region of space. So we start the New Year with an astronomical bang 🙂 The last few months of 2010 were amongst the worst (weather-wise) that I have known at the New Forest Observatory – let’s hope we get some better luck at the beginning of this New Year. Until February – clear skies to you all!